THE WORLD AWAITS. Welcome to the heady days of global finance! Money and deals are flowing like water. From sparse beginnings build your empire across the globe, sending agents far and wide as you expend capital and gain access to valuable resources needed to fulfil lucrative contracts. Struggle to dominate world markets and control resources regionally. Expand your interests, acquire companies that provide an edge on the competition and more efficient use of resources. 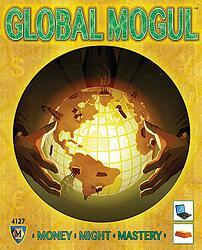 Global Mogul is an ever-exciting game for 1-4 players. Explore it solo, or share it with friends or family.